I have been going around meeting people on random pretexts and eliciting their family heirloom chicken recipes..Really I kid you not!This Easy Indian Chicken Curry recipe is from my dear dear friend who live in USA and has put together this recipe so that she doesn’t have to do any chopping, grinding or actually any additional work.I write this not to say she is lazy which she may or may not be but to tell you that it’s a easy recipe which needs less than 10 ingredients and you come away with a fantastic absolutely amazing crowd pleaser. 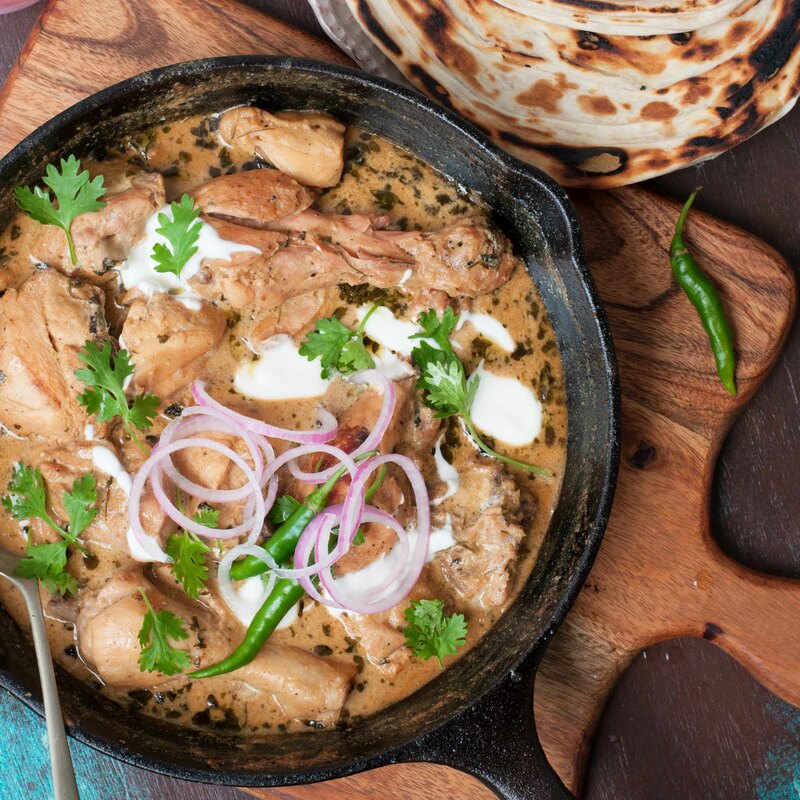 The first time I came across this Creamy ,super ,Easy Indian Chicken Curry recipe, I was slightly bemused which I am sure you are too, given that it doesn’t contain a lot of the usual suspects which make for a luscious gravy, but a luscious creamy gravy I definitely promise you! Just bear with me on this one, follow the recipe and I swear you will find nirvana..err or at least the greatest, fuss free,handsoff, Easy Indian Chicken Curry. As with any curry first let me describe why this is different from the others on this blog or else where.First,It has only 2 main Spices- Pepper and Dry Fenugreek(methi) ,so no roasting or grinding and the hooplah and second it has no onions or tomatoes which makes it obviously lot less tedious and zero chopping! Okay fine I stretched the truth a little bit..You will have to peel and grate the ginger and garlic but you could use those store-bought vinegary smelling ginger garlic paste if you like that more. I am going out on a limb here and declaring this super Easy Indian Chicken Curry the best “Bachelor”(pardon my assumption ladies) Curry ever.While I say bachelor I mean anyone who has no time, patience or an elaborate spice rack to make other more elaborate chicken curries or even a working knife..really! So dive into it..and do let me know what you think. Also,do Check out some other authentic Indian curries from the blog- Mangalorean Ghee Roast Chicken, Tamil Pepper Chicken,Kerala Prawn Curry & Chicken Keema. Marinate the Chicken with lime juice, salt and Yogurt.Set aside for 15 minutes minimum to a maximum of 24 hours. Heat the oil in a pan on medium flame. Add minced ginger and garlic.Alternatively make a puree of it with a splash of water. Add the chicken pieces one by one while shaking off the excess marinade.Without disturbing the chicken cook it on one side for about 5 minutes on high heat so that it browns a bit.This step will improve the look and the depth of flavour. Flip the chicken pieces and continue cooking undisturbed for a further 5 minutes. Pour over rest of the marinade on the chicken.Cook covered for about 25 minutes on slow flame. Uncover and give the chicken a good stir.If needed add more water.Check if the chicken is cooked by piercing through a thick piece. Add Cream,pepper and kasoori methi.Give it a gentle boil and your curry is ready! adjust the lime juice based on the tartness of the yogurt. Because this is a novice recipe I figured I need to supply some more deets on the more basic stuff..Like how to buy chicken. The age of going to a gory butcher shop is long past really.I prefer getting my chicken online.And no this isn’t a paid marketing stunt on my part but I like to live in denial.The fact that I can request any cut I want, at a time I want and without lifting a finger(figuratively obviously!) has sold me on buying my nonveg produce online- Freshtohome ,Liscious and Bigbasket are my all-time favourites, in that order. I usually order for the week-divide and freeze whatever I don’t need immediately and use as and when. To cook chicken curries , I use chicken with the bone and skin.Dont Baulk.I use chicken with skin because it adds a lot more flavour to the curry and cause my family prefers it this way.That said,If you are on a diet, watching your fat intake(a myth that’s been debunked!) then you can ask for a skinless chicken. Use medium sized pieces for any curry.Its debatable whether chicken should be washed or not and I will leave that upto you. If you enjoyed this Chicken curry do drop in a review.I would really appreciate it.